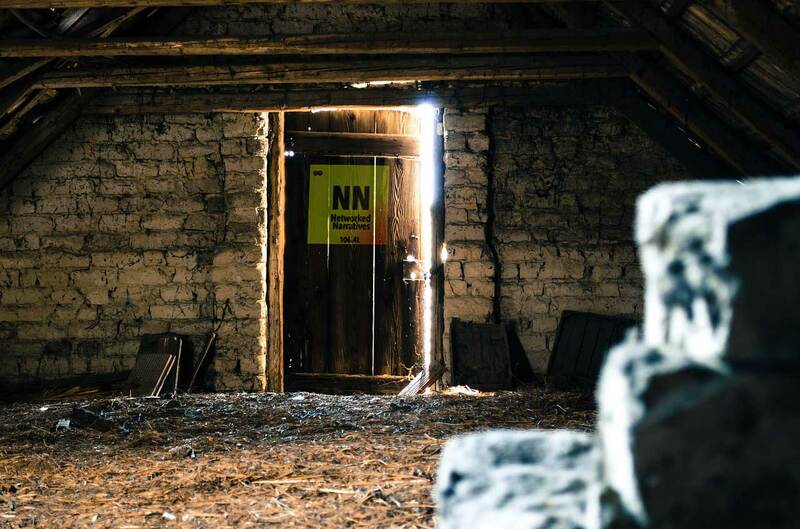 Who Wants to Walk Through the Strange #NetNarr Doorway? We must be off our medicine. Or on some new one. Or breathing strange vapors. Mia Zamora and I are ploughing ahead with an open connected course we call Networked Narratives with a door that opens January 16. We do have a full class of undergraduate and graduate students at Kean University who are even more strange, because they are taking this course for credit (there it is identified as “digital storytelling”). We’ve been talking to people about it since we ate some weird fruit at the DML conference in October, and I am fairly certain that are confused. A few wandered in, and out, of a Slack we set up. We had some good hypothes.is action on a concept page (we owe y’all a revision). We are going to be trying out a framework of asking participants to play with the idea of being “digital alchemists”, thoughtfully experimenting with mixing together the “elements” of media and storytelling. A big bunch of thanks go out to Laura Gibbs, Terry Elliot, andKevin Hodgson, who have been publishing all kinds of creative works to our #netnarr twitter hashtag and syndicating content to the blog hub. It’s going to be a laboratory hybrid mashup of DS106 media creation with Mia’s expertise in E-Literature. We have a site with blog syndication (signup for coming soon), a newly minted spawn of the DS106 Daily Create, and just posted last week, a loose outline of the skeletal structure we have mapped out for both Kean University and open students, where each month we have a different modality of interaction. There likely will be some kind of version of a DS106 Assignment Bank. February will be a series of virtual visits (Google Hangouts) to ELiterature artists, crafters, going to their studio. And weird stuff is going on. Top / Featured Image: The photo is modified from “Attic Door” pixabay photo by Kincse_j shared under a CC0 license, with a custom logo I created from srcatch superimposed on the door. Not sure how #dda got up without me knowing about it for an entire week, but I’m scrambling to catch up! haha – just what I was thinking! Remember, mystery is at the heart of story. Look forward to seeing you in the mix, at whatever level.